Author Jonathan D Smith is releasing “Island Flames,” Bermuda’s first ever book about the political murders, executions and Bermuda’s chronic race problems that resulted in the 1977 riots. The book’s description said, “The 1970’s was the closest Bermuda ever came to a revolution. Political murders marred the early years of the decade and in 1977, the Island was on the brink of public order meltdown when US Marines, 250 UK troops and more than 1,500 other Police, Regiment, Reserves, Firemen and others were deployed to restore order. “The riots were the most extensive and deadly riots ever experienced on the island. Fire damage to mostly establishment-owned businesses was extensive and three innocent people, two tourists and a Bermudian hotel worker, were killed at the Southampton Princess Hotel fire. “The riots occurred against the back drop of the murders of British symbols of power in Bermuda, Governor Richard Sharples, Captain Hugh Sayers, Police Commissioner George Duckett and two shopkeepers Victor Rego and Mark Doe between 1972 and 1973. “Two men, Erskine Durrant ‘Buck’ Burrows and Larry Tacklyn were arrested, tried and convicted for their roles in the murders. By the time of their December 2nd 1977 executions, the last hangings to occur on British soil anywhere in the world, Bermuda was sharply divided. On one side was the white-dominated UBP led by Harvard-educated businessman Premier J. David Gibbons whose Cabinet supported the death penalty. “On the other, lawyer Lois Browne-Evans, leader of the Opposition PLP and Tacklyn’s trial lawyer, opposed it. The country was similarly divided – mostly on racial lines. The healing began shortly after the riots when the Governor and both political parties participated in a Commission of Inquiry into the causes of the riots. Grenadian Lord David Pitt chaired the Pitt Commission. “Island Flames” draws on close to two hundred separate sources, including interviews with former Premiers Sir John Swan and Alex Scott – the last surviving Bermudian member of the Commission. “Fellow Commission member, UK Professor Dr. Michael Banton, now nearly 90 years old, described as the architect of the final Report, keenly added his insight into why the Report stood the test of time. “Readers will also learn what Reg Rawlins, later Bermuda’s Chief Fire Officer, discovered when he attended the hotel fire and how young Regiment soldier, later Senator Wendell Hollis, faced the prospect of death in the violent confrontation with rioters on Court Street. “The key UK Minister involved in the decision to hang Burrows and Tacklyn, Foreign Secretary Dr. David Owen was interviewed and defended his decision that the men should hang. He now sits in the House of Lords as Lord Owen. The research delved deep into once ‘Secret’ and ‘Classified’ UK Government files to reveal new information about the diplomatic breakdown between Governor Sir Peter Ramsbotham, Dr. Owen and the Foreign and Commonwealth office; the UK Government’s flip-flopping on the hanging decision; the military options of ‘shoot to kill’ to control the rioters; Top Secret anti-communist operatives who worked in Bermuda to counter the Black Power movement; a Cabinet split and key decisions about foreign policy and the hanging decision, traced to the desk of the UK Prime Minister, James Callaghan and much more. “Guest contributor, Cordell Riley, the respected former Government Statistician, writes a chapter in the book and offers his views on the trajectory Bermuda has taken since 1977 and analysis of what has changed, and hasn’t changed in the near-forty years since the riots. Author Jonathan D Smith said, “Thirty-eight years after these deadly events and I was astonished that many young Bermudians had no clue about these events. This was a time of immense upheaval, stress and fear. The murders, executions, race riots and why a country nearly imploded were all inter-twined and the times are historically significant. “I hope the book adds to the rich fabric of our tragic past, yet hopeful future. In order to forge a path ahead, we need to be acutely aware of the path taken. The book proved to be an immense challenge. Information from diverse sources was weaved together to create the chronology of events through the deadly decade of the 1970’s. “Now that it is complete, I hope that readers in Bermuda, the Caribbean and all over the world, can reflect on this volatile period when race, economics, politics, the death penalty, murders, executions, UK policy and the justice system collided – with deadly results. The truth is now out as to how the decision to execute was made. 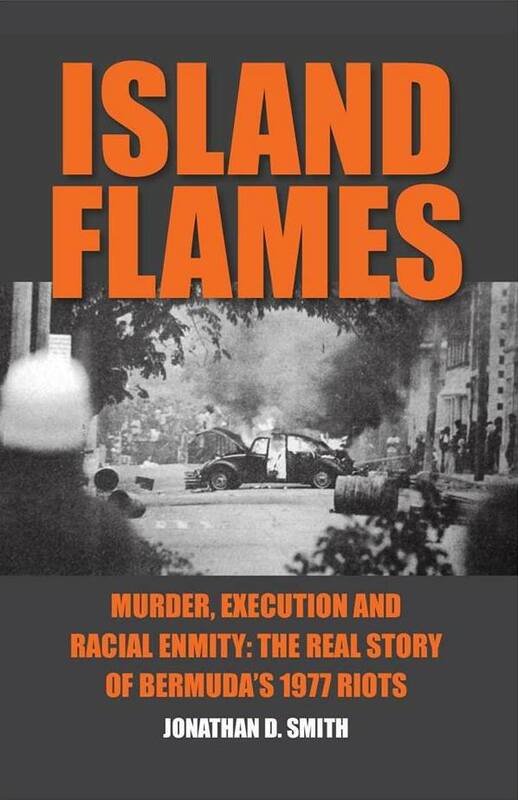 “Island Flames,” is a hard-back edition, 360 pages in length, indexed with more than 1,000 references and 44 photographs of the 1965, 1968 and 1977 riots – many of them never-before published. Brimstone Media, a Bermudian company, provided editing, layout and graphic design services to the final manuscript which was printed in China. This is the second major non-fiction book completed by former Commissioner of Police and Senator Jonathan D Smith. His first book, “In the Hour of Victory,” a true story of Major AF ‘Toby’ Smith’s WWII experiences and death in battle was published in 2011. The documentary film version of the book won major awards at international film festivals in the UK and USA in 2013. Mr. Smith is now working on a third book, “Black & Blue” which will take a critical look at policing in Bermuda from the 1970’s to the current day. Any price set yet? I need to know how much to set aside so I can get a copy on time. I prefer electronic reading, but I can’t find it in any electronic format… I don’t have a lot of book shelf room, so my kindle has been great for increasing my reading habits. Might have to breakdown and eventually buy a hard copy, though is would hope that an electronic would still become available in the near future. You mean there is racism in Bermuda ? which is “documented” as recent as 1977.. That’s less then 40 years ago.. but heh,, its all in their minds..
Only the folly of a few would deny that, and as the ‘history’ lecture at Liberty a couple weeks ago shows, it is still being kept alive and well. Did anybody ever get convicted for killing three innocent people, two tourists and a Bermudian hotel worker? If memory serves me correctly one person was convicted and served a prison term . I also believe that soon after his release he was involved with another crime (on a tourist) a put a hatchet in their skull . Your history is a little one sided and ignorant, but carry on. Your answer is no. Well nobody got convicted in South Africa either. The fact is “impressive” is that the Europeans are STILL benefiting from that embarrassing era and would prefer if you would just get over it and let it go and try to insult you and call you ignorant. But if a Jewish person comments on the Holocaust they will get compassion, but let African descendants talk about their Holocaust(which we are still feeling the effects through Racism, Economic Disadvantage and Social Privilege) and you get reprimanded. @impressive, maybe you should be asking if those that actually captured and SOLD the people from their homeland, were ever convicted??? Can you explain how hundreds of thousands of people were captured by just a few in the first place? And your point is? And where is your book? THIS BOOK SHOULD HAVE BEEN OUT WHY NOW 2015? U GOING TO START A ROIT! you have a chip on your shoulder,that’s tough! No, the book will certainly not start a riot. You ask why now, why couldn’t this have been written much earlier. This book could not have been possible prior to 2008. A substantial part of the research is based on previously classified UK Government files held at the UK National Archives where they were sealed for 30 years. The most current documents used in the book were from 1978. Why 2015? The answer: why not? The book invites the reader to compare and contrast the post 1977 era of the Pitt Commission and all of its recommendations to chart a new path for Bermuda, with 2015. Although the substantive book is not an opinion piece, I did invite well respected researcher and statistician, Cordell Riley to complete the book with a chapter examining what has happened since 1977. There are some striking similarities in the issues raised in 1977 and those being raised today. We have not yet resolved several of the pressing problems we face – such as race based politics, education, immigration policy, disparity in earnings, tax structure, and there are more (also raised in the Pitt Commission report 38 years ago). You’re quite correct…It’s in the global agenda…and the sheep will follow. Learn about your pass so you do not repeat it. SI hope every page does not have the usual script of ” blind faithfulness ” in it, along with a hundred periods, in between the words? example being, really…………….REALLY……….. .reallly…….. If only the release of this book calls back home the many thousands of Bermudians who left before , during and immediately after the riots of ’77 up to 1981 . Come back home ! Let’s bring about the new Bermuda that was envisioned when a lot of us went to college and university abroad . Let’s bring our families back , some for the first time ! Buy the book ! We lived it , we know it , we understood exactly what we were up against ! Many of the mean characters of that era are dead or dying . This book should be the clarion call for the Bermudians scattered throughout the diaspora . There is a place for all of us , let’s take it and make it . What’s hidden in the dark shall soon be revealed ! However, in my opinion, this is only going to inflame more division and more racism in Bermuda. I just can’t get my head around how this book is going to help Bermuda heal? You can say all you want that making everyone aware of the path taken is going to help us forge ahead. I just don’t see it working in that direction! I see it working the opposite direction! The title alone makes it unnecessarily sensational. Good luck to the author…I hope you make lots of money off the story! If you deem the title inflammatory, then one should go back to the Pitt Commission for the explanation. In the Pitt Commission’s report, they used the phrase “…flames of racial enmity.” Their statement was that the riots erupted in Bermuda (Island) because the “…flames (Flames) of racial enmity” could no longer be controlled. Thus, Island Flames is not intended to be inflammatory but instructive and, importantly, historically relevant and accurate. There’s a title explanation contained in the book which explains this is greater detail. PLEASE READ the book before you make negative or positive comments. DUH!!!! !